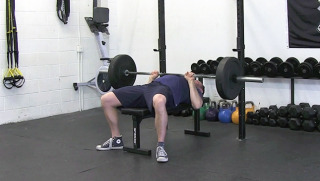 Start on your back on the bench holding the barbell slightly narrower than your own shoulders. Keep your shoulders down and your elbows tucked in as close as you can to the side of your body as your lower the bar to your chest. 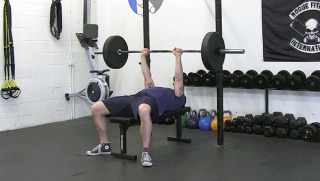 Press the bar back up to the starting position, fully extending your elbows at the top of the press.